2 hours. Mix the turmeric, cinnamon, coriander, cumin seeds, cayenne pepper and cardamom. Heat half the oil in a frying pan and sauté the onions until soft. Add the spices, ginger, garlic and bay leaves and cook for 3 minutes. Set aside. Heat the remaining oil and brown the shanks. Add the onion mixture, tomato paste, salt and 400ml water. Simmer covered for 2-3 hours, until lamb is tender and the sauce has thickened. 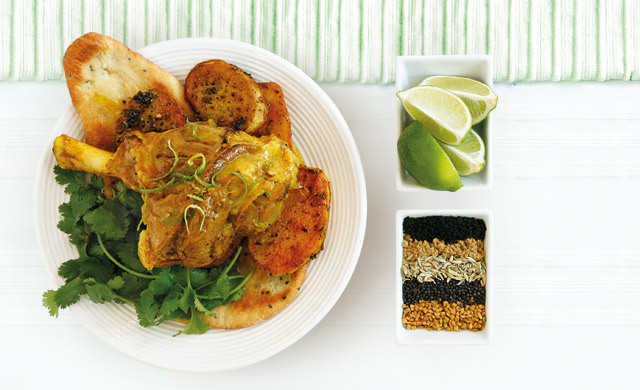 Scatter with nigella seeds, coriander, lime zest and serve with naan bread and Panch Phoron potatoes. Heat the oven to 180°C. Heat 3T of oil in a pan and fry potatoes until brown. Mix the turmeric, chilli powder and salt. Place potatoes in an oven tray and sprinkle with this mixture. Heat the remaining 1T of oil in a saucepan and gently toast the Panch Phoron. When aromatic, mix in fresh chilli and coriander. Spoon over potatoes and bake for 15 minutes. *To make 150ml of this popular Indian spice mixture, grind together 2T each of the following seeds: black mustard, nigella, cumin, fenugreek and fennel. Nigella seeds (kalonji in Indian) are often confused with black cumin, black onion seeds and black caraway, yet once properly identified, this miniscule, dusty, jet-black, heart-shaped seed is unmistakable. It has an earthy flavour that combines well with other spices or foods, and is an irreplaceable ingredient in the Indian Panch Phoron five-spice mix. Its crunchy texture is used to good effect when sprinkled over soft tandoor-baked breads, such as naan, before baking, as is done in northern India. The seeds are used prominently in Indian and Middle Eastern cuisine, and are occasionally seen in the West as a pepper substitute. The nigella plant, also known as ‘love-in-the-mist’ is a herbaceous annual of the buttercup family which grows to 45cm. The white flowers have blue veins and yield a seed capsule with five compartments, each topped with a spike. The compartments open when dried to disperse the nigella seeds. Nigella is native to western Asia where it grows wild and is also cultivated, as it is in India, Egypt and the Middle East.